It occurred to me recently that I could not remember the last time I wrote anything creatively. I certainly couldn't remember the last time I wrote anything for me. When your career to date has revolved around words, funnily enough, your own words take a back seat. I've spent years writing for other people. In more recent times I've spent hour upon hour poring over, deconstructing and reconstructing the words of another. But when was the last time I wrote anything for me? I'm not sure I ever set out to be a writer. When I was younger I wanted to be a newspaper reporter a la Lois Lane. I then learnt that the proper term was 'journalist'. I graduated a journalist, ready to take on the world. I became an editorial assistant, deputy editor and editor. I'm now a proofreader, journalist or editor. So the question remains, am I a writer? Have I ever been a writer? Do all failed writers ultimately become editors? I'm not sure. 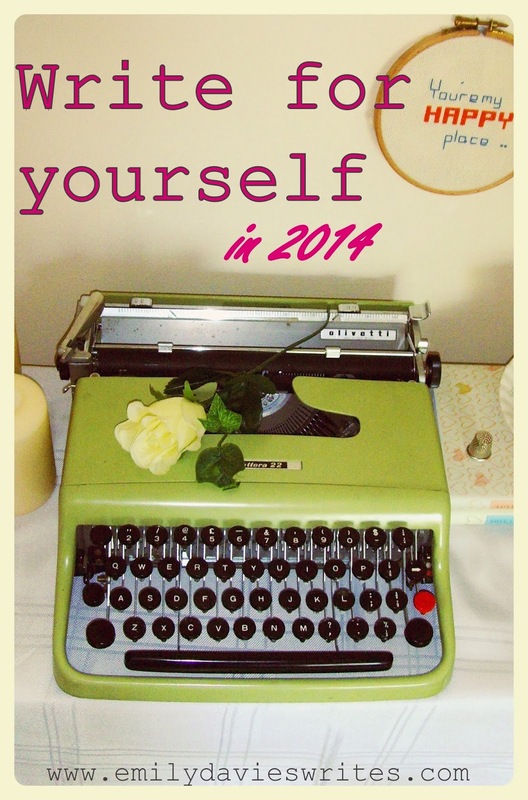 So 2014, I've decided, is the year to write. And not just that, but the year to write for me. The year to write for fun. Not to get published. Not to blog. Maybe not even to be read by others. But instead it's the year to get creative, to hone my craft, to journal, to play with words, to develop a discipline. The year to become a better writer. Journal for five minutes per day. By hand. There is something more tangible about putting actual pen to actual paper. Filling up beautiful notebook, page by page. You track your journey. You progress through a finite book. It feels more creative, more emotional. It's for your eyes only - there's no publish button at the end. But in the same vein, it's for future generations - your grandchildren are far more likely to finger through your old diaries than they are to look through your computer folders! You can achieve five minutes per day. But you don't have to stop at five minutes - pour out your heart. Spend five minutes on a creative writing exercise. These exercises help you to write about something specific without the end goal being publication. But you never know where they might lead or what they might combine to create. They're short and snappy so you can fit them in but they get you thinking creatively about every day topics. Invest in your writing first. Before you sit down to blog, work, edit, proofread or administrate, before you do anything else, write. Your blogging and editing will be better if you have done your journalling and creative writing first. See it as an investment in yourself. In your talent. In your career. Turn it into a daily discipline or ritual. Get the baby off for a nap, sit down with your favourite drink and spend these 10 minutes writing. For yourself. It's only 10 minutes, you'll still get everything else done!